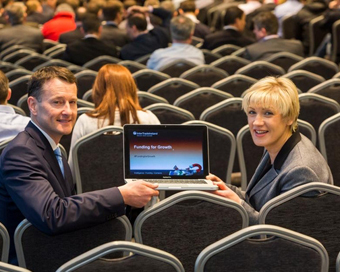 InterTradeIreland – Discover What’s Possible! We’re excited about this week’s launch of InterTradeIreland’s new look website which encourages SMEs to ‘Discover What’s Possible’. The body helps SMEs across the island by offering practical cross-border business funding, Intelligence and contacts. This month also sees the launch of their cross-border study – SMEs, Credit Constraints and Growth. This report uses detailed survey data collected by InterTradeIreland to examine the financing structures and obstacles of firms across the island of Ireland. The research presented covers a broad spectrum of issues related to the funding of the SME sector. It begins by looking at the types of finance most commonly used, the demand for finance, then examines the extent to which firms are subject to credit constraints, if these constraints affect their overall performance, and how widespread financial distress is amongst firms. Finally, the report examines if the banking system North and South of the border impacts on these issues, looking in particular at the question of whether banks operate different strategies outside of their core domestic market. – Most firms use short-term sources of finance: the most common product used is an overdraft facility, which is used by approximately 40 percent of firms. The percentage of firms using commercial loans was 22 percent in 2012 but reduced to 17 percent in 2014. – Larger and more established firms are more likely to use all of the different finance types, with smaller and younger firms having access to a less diversified set of products. – Application rates for credit fell between 2012 and 2014. – The percentage of firms identified as credit constrained fell by half between 2012 and 2014. – There is no statistically significant evidence of differences in the incidence of credit constraints across countries but Northern Irish firms are less likely to experience financial distress. – Smaller and younger firms remain more likely to be credit constrained. – With the decline in the levels of credit constraints, there is no evidence of this type of constraint having a negative effect on firm performance. – The percentage of firms reporting no experience of financial distress increased from 40 percent in 2012 to 63 percent in 2014. – Property debt overhang continues to be a problem for some firms. – There is no evidence of different behaviour by banks operating cross-border. Ensuring that firms have access to the financing options appropriate to them and that they are not constrained by funding limitations from undertaking positive investment projects is an important ingredient in supporting economic recovery and growth. This is particularly important for Small and Medium Enterprises (SMEs), given that they have generally been shown to have less diversified financial structures and tend to be more exposed to negative economic and financial shocks than are larger firms.